This is the seventh in a series of articles by Epoch Times staff describing the foundations of Chinese civilization, and setting forth the traditional Chinese worldview. The series surveys the course of Chinese history, showing how key figures aided in the creation of China’s divinely-inspired culture. Here we continue the saga of Yu the Great, the hero who subdued the Great Flood. 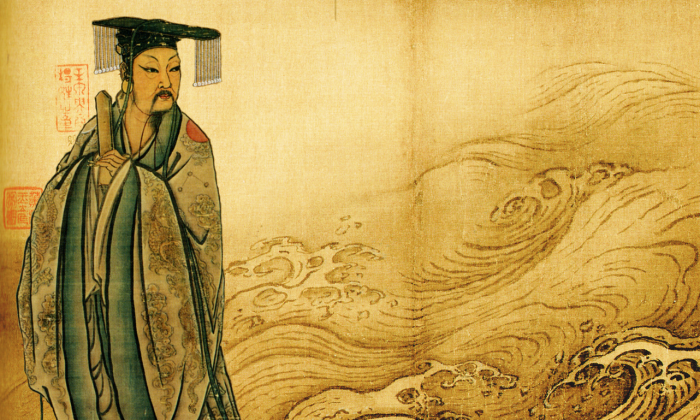 After finishing his work along the Yellow River, Yu the Great turned his attention to southern China, land of the mighty Huai and Yangtze rivers. Though he had attained the age of 30, Yu was still single. “There must be some auspicious sign if I am to take wives,” he said. Yu was hesitant to trust the fox, but it then assumed the form of an old man with a flowing white beard. “I came to you in the image of a nine-tailed fox because you said you needed an auspicious sign before you could marry,” he said. Seeing this elderly sage, with his divine bearing and righteous demeanor, Yu reconsidered. Did not the nine tails of the fox reflect an upright Yang nature and carry a royal air? He accepted the request and married the king’s daughters Nü Jiao and Nü You. Regardless, Yu did not lose sight of his responsibilities. Four days after the marriage, he returned to subdue the floods. A famous symbol of Yu the Great’s dedication to his work and people is the story of how he passed his home three times without being able to stop for a meal with his wives and children. While leading the projects to dredge the lower reaches of the Huai River and reshape Mount Tu and Mount Jing, the locals welcomed Yu with festivities. After attending these briefly, Yu went back to the construction grounds along the Huai rather than return home. The construction was successful, and the region of the lower Huai became fertile and prosperous. Later, as Yu was travelling to the state of Yang, he passed the gate of his home to hear a baby’s cries. But there was no time to spare and he continued forward on the road. The third time, a local from Mount Tu told Yu how happy his wife Nü Jiao was to hear that he would be passing through the area, and that she was looking forward to his visit. But still Yu was drowned in work and could not meet her. She stood holding their child on a large boulder overlooking his route, along which he walked on his way to control the waters. It is said that there is a boulder called Wangfu, and that this is where Nü Jiao stood awaiting her husband. Between Mount Taishi and Mount Shaoshi in what today is Henan Province lay the narrow strategic pass of Huanyuan. As a large amount of water was backed up behind this pass, Yu the Great personally took the task of widening it. At that moment, Yu’s subordinates reported that his wives Nü You and Nü Jiao had arrived to visit them. This came a surprise, especially considering that Nü You was heavily pregnant. “Wait for me here and I shall come after finishing everything,” Yu said. At midday, the two women heard the sounds of Yu’s drum. They went arm in arm to see how the work had turned out, but instead of their husband, there in the cave was a majestic yellow dragon slashing away at the solid rock. Yu had assumed a divine form to complete the superhuman task, and, fully absorbed in his work, had accidentally struck the drum with his flailing tail. Seeing this impressive yet shocking scene, Yu’s wives fled down the mountain. Having finished with Jing State and Huanyuan Pass, Yu moved on to the massive state of Liang. This region covered nearly 700,000 square miles and was centered on what is now Sichuan Province in southeast China. Complex tributaries and hemmed-in mountains characterize the upper reaches of the Yangtze River, which ran right through the state. In the chaos of the flood, it was difficult for Yu to establish and release exact waterways. The key point here was the Three Gorges, located at the middle reaches of the Yangtze. At the time, the vast mountains of Wu stood in the area, blocking the waters of the Yangtze from flowing eastward. The rock was hard and impassible, so Yu called upon Madam Yun Hua, the daughter of the Queen Mother of the West, for assistance. The goddess unleashed her divine powers, using thunder and lightning to strike the mountains and loosen the rock until it could be managed by human hands. Yu then directed his men to clear the Three Gorges, and the flood began to empty downstream into the Pacific Ocean. As the water released from the Three Gorges flowed along the lower Yangtze, it formed five lakes—Dongting, Poyang, Hongze, and Chao. The course of the modern river was set. Intriguingly, the legendary acts of Yu the Great may have some geological basis. 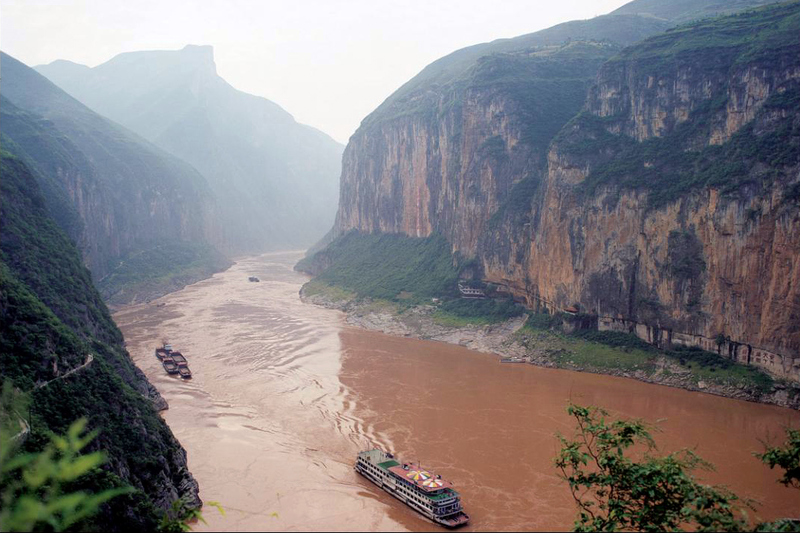 The Yangtze River cuts across the Xiling Gorge at the core axis of the Huangling anticline, suggesting that there were once mountains where the Three Gorges as we know them today lie. Read the next installment here.